This is the second in a two-part series focusing on the critical role of clinical informatics in improving user experience. While the first part centered on the ‘what’ and the ‘why’ when it comes to informatics (including how it can specifically help improve workflow), this piece will delve into various roles that exist within the space, the challenges these individuals face, and how they can be addressed. Clinical analysts. Generally, they work with end-users to analyze, build, test, and implement clinical content in an EMR. While analysts are the backbone and workhorses of configuration for most EMRs — they generally focus mainly on the tools inside the EMR, and often do not have time or expertise to manage additional workflow tools that may be necessary outside the EMR. Application Support Professionals. These are often the ‘second-tier help desk’ or ‘second-tier support’ professionals who work with the help desk to respond to more detailed user questions, troubleshoot issues, and provide elbow-to-elbow support for end-users. Clinical/credentialed trainers. These are experts at studying clinical workflows, studying application features, developing training materials and curricula, and delivering training in classroom and online settings. They also sometimes assist application support professionals in direct elbow-to-elbow settings. Project Managers. These individuals (many with PMP certificates) who are experienced at planning, budgeting, scoping, and leading projects. Their tasks include meeting frequently with stakeholders, developing detailed project plans, timelines, and deliverables, and keeping the team on schedule and on budget. Analytics professionals/report writers. They are focused on getting data out of the system, validating it, interpreting it, and displaying it in a meaningful way, to help advance clinical care and research needs. Process Improvement Specialists (E.g. Lean or Six Sigma). These are trained professionals who typically report to quality to study clinical processes, study outcomes, and improve upon them. They may or may not have clinical experience. 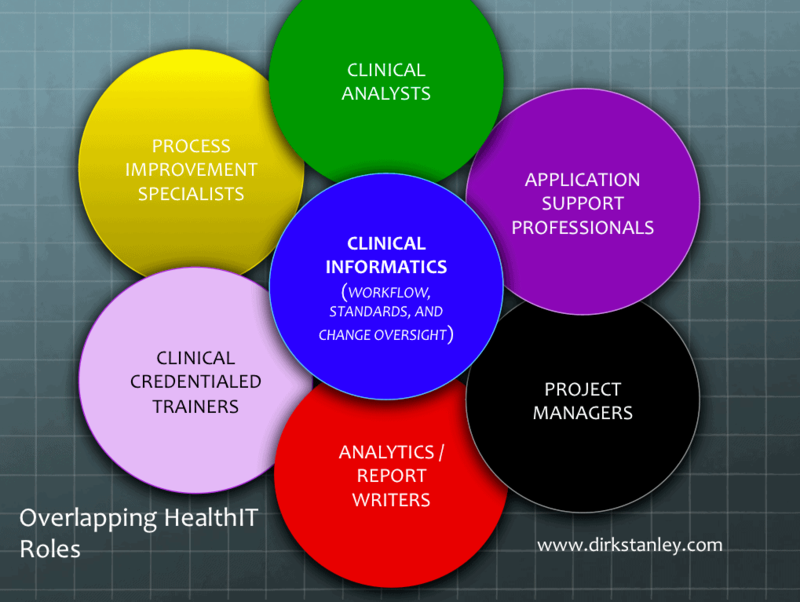 While clinical informaticists may work with all of the above, or fill some of all of these roles, the informatics role is unique in their ownership of implementing clinical workflows, change management, standards, clinical terminology and translation, information design, indexing, archetype analysis, usability, and clinical outcomes. Clinical informaticists are skilled at critically evaluating details of workflows and configuration, and adjusting them if needed. While it is not always necessary, most come from clinical backgrounds, which is very helpful when trying to navigate clinical terminology, roles, or processes. For many years, clinical informatics was a poorly-understood, poorly-controlled term. Since clinical analysts, application support professionals, clinical/credentialed trainers, project managers, analytics professionals/report writers, and process improvement specialists are all involved in information design and EMR support, some of them might refer to themselves as ‘Informaticists’ or ‘Informatics professionals.’ Unfortunately this loose association clouded the role for the new generation of clinical informaticists who come prepared with formal informatics training and certification. Clinical informatics often reports to IT departments, where there can be a competition for resources. 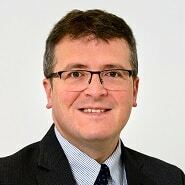 Software vendors, seeking to lower the cost barriers-to-entry for their products, sometimes minimize the importance of having clinical informatics professionals available on projects to help support the clinical analysts, clinical trainers, report writers, application support professionals and process improvement specialists who help develop content and support end-users. Some organizations believe they can save significant time by replacing clinical workflow evaluations and operational discussions with ‘sample content’ that has already been developed by another organization. Unfortunately, these workflow evaluations and clinical discussions are still necessary to validate and align configuration with end-user needs, expectations, and training, which doesn’t allow for much saved time. This somewhat-ironic ‘Informatics terminology issue’ was recently highlighted in this humorous segment from the November 2018 AMIA conference in San Francisco, featuring President and CEO Doug Fridsma. Given these terminology, budget, and support challenges, many health IT projects and EMR implementations occur with little or no significant informatics support. 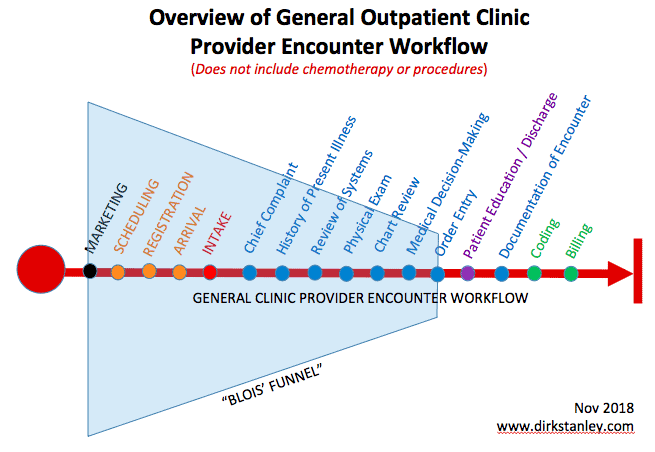 Making great clinical configuration, workflows, and outcomes is a lot of work. Many organizations struggle to have the time or resources to fully complete all steps, and so, to meet project deadlines, they often have to make compromises — while still trying to fulfill as many of the steps as possible. It is usually difficult to manage all of the steps of a ‘best-practice’ change control and project management process. This can result in user dissatisfaction, lack of engagement, and unplanned outcomes. Other roles (clinical analysts, application support professionals, clinical/credentialed trainers, project managers, analytics professionals/report writers, and Performance Improvement specialists) may have translational challenges when trying to engage with clinical staff. Without adequate analysis, scoping, prioritization, and design pre-work, analysts may spend time rebuilding workflows that require frequent adjustments. Healthcare is a team sport; do the physician, nursing, and pharmacy leaders need to meet to critically assess and re-evaluate their shared clinical goals and needs? And, are there trained clinical informatics professionals available to help educate, evaluate, and oversee all of the above? Finally, I want to thank Dr. Gawande for writing such a great, real, and thought-provoking piece. Burnout is a real issue, and we need to work together to combat it. I hope my discussion helps shed light on how clinical informatics can help change the environment for both providers and patients. This piece, authored by Dirk Stanley, MD, a board-certified hospitalist, informaticist, workflow designer, and CMIO based, on his blog, CMIO Perspective. To follow him on Twitter, click here.